I sail a Valkyrie Craft Erne Tourer which is 3 inches wider than most canoes for greater stability and correspondingly heavier. 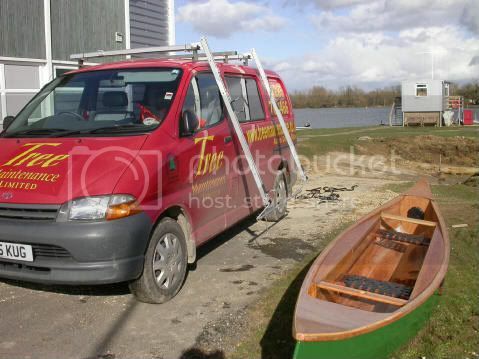 As I wanted to be able to go sailing on my own (living dangerously or what ), I converted a trailer to carry the canoe, mast, sail and outriggers, so I didn't have to break my back getting it on and off the roof rack. I bought a Daxara 107 trailer (same as an Erde 102) which is the smallest lightest trailer you can get, on special offer for £140. The shaft was only 1 metre long but was made of standard mild steel box section, so I got a 3 metre length of box section fitted instead. This what it looks like. The tow hitch unbolts from the original bar and bolts on to the new bar which is bolted onto the underneath of the trailer. I got a bicycle holder lightbar to hang from the back. Initially I tried hanging it from the canoe, but the ropes kept coming undone, so I just attached it to the back of the trailer with cable ties. The trailer is very light and you can easily wheel it by hand up and down slopes with the canoe on top, to get to the waterside. It tows really stably (at speeds which are illegal) over long distances (to Lake Windermere and back by ferry across the Irish Sea. Also a few other long trips of several hundred miles). The suspension absorbs bumps well, although you need to travel very slowly on a non-tarred road. I'll do another thread about my sailing rig and outriggers. That's brilliant. Thanks for showing us the trailer. I would have thought that with the canoe sticking out so far back you would need something to make it more visible - like a fluorescent rag or something. Also is it legal having the number plate so far from the back? My only reservation would be that the light board should (maybe?) be at the end of the load, so you may need to look at modding that. Or have you checked that out? I saw a picture of your trailer set up on one of your bloggs and it strikes me as a brilliant solution and very economical as well. Could this be the road equivalent of the B & Q trolley? Looks to me like a possibility. Nice looking conversion on the trailer, but keep your eyes open for the boys in blue !! If you don't understand, you'll need to ask. If you have to ask, I'll need to explain. I have streamers hanging out of the back and the end of the mast. That should be okay for the daytime. I must get a cycle rear lamp for night. My original plan was to hang the light bar (designed for hanging over a bicycle carrier) from the back of the canoe. The rope kept undoing however as there is severe turbulence if you're driving fast, so the edges of the light bar are rather rubbed. "Between a one and two metre overhang, you must ensure the end is clearly visible, between two and 3 1/2m , a marker board must be fitted and illuminated at night (overhanging load triangle red with white stripes as seen on steel RSJ delivery lorries) More than that, and an attendant must be carried and police must be notified two days prior,"
My overhang is approximately 2 metres beyond the back of the trailer, so I am probably just legal as I am at present. Maximum overall overhang, front and back, in total, of 1.5 metres. Therefore the front of the trailer connected to the car is okay BUT 2 metres at the back would be a no, no. I suppose, that because we do it commercially, we are a little more careful, or have to be! However, if you get a jobsworth, you could have to leave your trailer on the side of the road, if stopped. I heard from one of the guys in the trade about 6 weeks ago and that is what happened. They were stopped, the officer wasn't happy with the trailer set up and they were not allowed to proceed. There then followed a 250 mile round trip to rescue the load and the trailer was "condemned". I will add that the trailer was perfectly road legal. The main issue here is that the DVLA and VOSA rules are soooooo open to interpretation that it leads to terrible confusion. 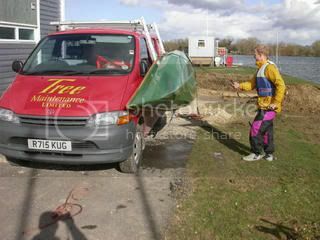 You should have seen the hoops we have jumped through to make a commercially saleable 2 canoe trailer!!! Put it this way, I wouldn't tow yours through West Mercia or the South West...without a predetermined rescue package...seriously. I know this is not the solution to the trailer issue but it's my way of dealing with a very heavy boat. Once strapped on I lift and slide the boat onto the roof - Easy Peasy. I Strap the mast to the handle of the roof rack. One idea I had was to add a bar suspended above the drawbar - this would then be the first bar for the canoe and the front of the trailer would be the second bar. This would bring the canoe forward by say 1m. Obviously the drawbar would need to be strong enough and long enough. Another option is one that I saw on the rowing club trailer from Uni. They had a bar like the drawbar but coming from the back, the lights and number plate were mounted to that. Without looking at the trailer I don't know where you could put one but there is probably somewhere you could put either a single bar or a double. Failing that some sort of bracket for the light bar that mounted to the canoe - maybe a bar from the trailer to the tip of the boat and strapped on at each end. Of course if the police in your area are fine with it (51 previous journeys might indicate they either haven't noticed or don't care) then it's fine. Just to confirm the issue that people have is the distance from the light bar to the canoe, not the overhang from the trailer itself to the canoe? Maybe you should read up on your knots. But seriously, I like the cycle lamp idea, I might copy that as my canoe overhangs a bit at the back of the car. Its belt and braces technology, but if it stops an accident, then who cares. The trailer itself looks balanced and safe, so it probably doesn't attract attention to itself. Traffic is much less here in Northern Ireland (so less cops about too). I can't remember seeing a police car on my 51 trips to date.